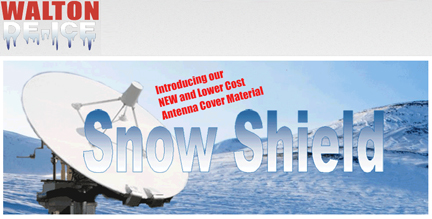 [SatNews] Walton’s Snow Shield Covers now come in three varieties, all of which surpass our competitor’s coverings in giving you better performance at lower system cost. You may now select from a variety of options based on your performance, operational and budget requirements. Unlike competing products that need to be removed during warmer weather to increase their useful life according to manufacturer's suggestions, Walton Snow Shield architectural fabric with either a Kynar® or Tedlar® coating give you years of service, without the need to remove the Snow Shield Covers during warmer months. Compare the costs and downtime of having to replace your antenna cover several times over a 10-year period using our competitor’s models. With Walton D-Ice Snow Shield Covers, an installed Kynar® or Tedlar® Snow Shield Cover will function from 10 to 15 years. PTFE coated PTFE fabrics offer a usable life of 20 plus years.